The final stage of the Our Voices project, led by four different partners (ATD Fourth World Ireland, ATD Fourth World Poland, ATD Fourth World Spain and Andecha, a Spanish civil society organisation) was held in Strasbourg on 15 June 2017. This project, run for more than a year, aimed to create stronger links between people experiencing poverty and social exclusion and European institutions, and to deepen discussions on the future of Europe, underlining the need for a socially inclusive Europe. This was the occasion for small delegations from each of the three countries to meet in the European Parliament and in the Council of Europe, and to present the work accomplished throughout this project to members of the Parliament and members of the Department of the European Social Charter. Indeed, after several meetings to discuss social issues in Europe at the local level, and more specifically topics related to health, work and employment and the relationship between beneficiaries and institutions; and after four official meetings gathering the three countries respectively in Ireland (March), Spain (June), Poland (November) and the International Headquarters of ATD Fourth World (March 2017); at last the time had arrived to present the results of our combined work. On 14 June, the delegations flew to Strasbourg, ready to hand in to the representatives the final report, including learnings from the three countries and messages from the four partners to all the stakeholders involved in the building of an inclusive “Social Europe”. Creating a more inclusive Europe requires the participation of people fighting poverty and social exclusion on social and human aspects of the European Union construction. On our trip, we were also accompanied by Gary and Belinda, members of the SAOL project, who took part in the local meetings in Dublin. They were there to spread the word from the women who are part of the project, but also to present their work called “Object Poverty” to the European representatives. On the first full day together, we met at the European Parliament and were introduced to Marie-Alix, a young woman assisting a French MEP, Thierry Cornillet. She showed the delegations around the European Parliament and stayed with us throughout the visit. Then, we gathered in the EP’s cafeteria and met Mairead MacGuiness, the Vice-President of the European Parliament. She welcomed us and was introduced to the “Object Poverty” project. She took time to speak with two of the delegation from Ireland, Robert and Ciaran. Then we gathered to meet up with the Intergroup fighting against poverty in defence of human rights. This was chaired by Silvia Costa, a member of the Poverty Intergroup Bureau and Mairead McGuinness, and included Verónica Lope Fontagné, a Spanish MEP. As Mareaid MacGuiness said about the role of Europe in reducing poverty, “Europe is a very good story, but not everybody is looked after in that story. And the message I get when I speak to you is not one of hopelessness, but one of leading people to understand what it’s like to be on the margins.” Then we presented the video explaining the “Europe For Citizens” project, and the steps taken to make this project concrete. This helped the members of the Intergroup have a better understanding of the project over the last year or so. Following this, each member of the project introduced the main learnings in their own country on the topic chosen. The main conclusions, for all the countries, highlighted the increasing number of people being left behind in the Europe 2030 strategy and the lack of direct links between the EU representatives and citizens. Our report also stressed the need for more cooperation between Europe and its citizens, and emphasized the role of Europe in reducing the problems of poverty and exclusion experienced by many citizens. The members of the Intergroup endorsed our conclusions: “I would like to say that we [European representatives] are also here to listen to you. Maintaining a connection with you, bearing witness to your problems, and hearing about the hardships you are facing is one of the necessary conditions to do effective work. The only thing is that we need to meet and keep in touch more often,” as Veronica Lope Fontagné said. Leaving the European Parliament, we gathered at the Human Rights and Poverty Stone in front of the Council of Europe. 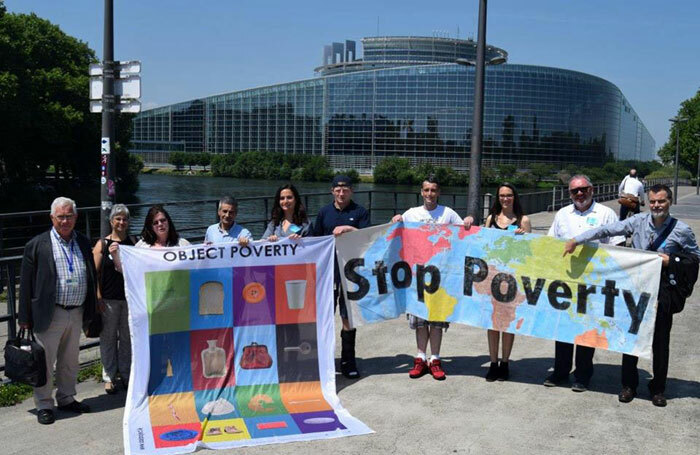 There, we decided to take some pictures with our banner “Stop Poverty”, to promote the 2017 ATD global campaign marking the 100th anniversary of the birth of Joseph Wresinski, founder of ATD and the 30th anniversary of the World Day (17 October) for the Eradication of Poverty. Finally, we met with members of the Department of the European Social Charter of the Council of Europe, including Régis Brillat (Head of Department), Nino Chitashvili and Elena Malagoni. A discussion took place on the potential of the Social Charter and how it could help the learnings from the Our Voices project become more concrete. While introducing the members of the Department of the European Social Charter to the learnings of the project, we also learned more about their work, which helped reduce the distance with the European institutions. Overall, it was a time of mutual fruitful exchange, and it marked the last step of the Our Voices project. We ended this project in Strasbourg having had a successful meeting with the European representatives of the European Parliament and of the Council of Europe, and hoping that the results and conclusions from Our Voices would spread within the European institutions and lead to positive changes in people’s lives, especially for the poorest of the citizens of Europe. Download the Our Voices project report. 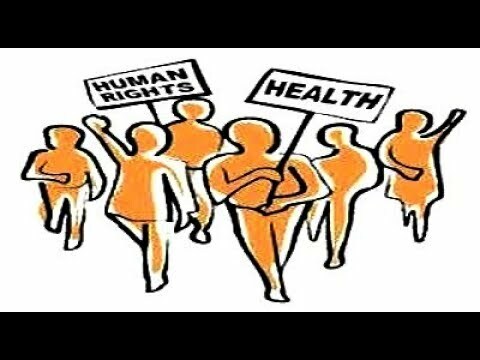 Video prepared by ATD Ireland for the “Health as a Human Right” Seminar (27 June 2017 – Dublin) for the Our Voices project.